The table below summarises the data (above) into a table so it is easier to analyse. 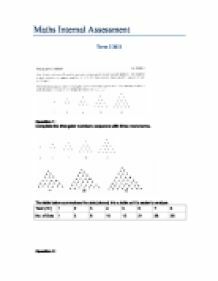 Find a general statement that represents the nth triangular number in terms of n.
The table below shows the connection and calculation between the term and the number of dots for the given triangular numbers. Square numbers are also geometric shapes which lead to special numbers. Therefore, we must take into account these square numbers in order to find out the general statement. Excluding the first layer (layer 1), as the stage number (Sn) and layer increases by 1, the number of dots correlatively increase by 12. Find an expression for the 6-stellar number at S7. As we discovered the connection between the number of layers and the number of dots, an expression for S7 can be calculated. Therefore, the expression for the 6-stellar number at stage S7 is (12 x 21) +1. Find a general statement for the 6-stellar number at stage Sn in terms of n.
Similar to using square numbers to find out triangular numbers, finding the general statement for the 6-stellar number will require the manipulation of triangular numbers. When the expressions are written this way, we can relate the 6-stellar numbers with triangular numbers. The focus is on the circled number in the expression as they correspond to the n-1th of the triangular term. In other words the general statement for the 6-stellar numbers is (12 x (n - 1)) + 1. However, this expression is not complete as it does not apply to the 6-stellar numbers. Therefore, as previously stated, for the triangular numbers, n-1 = n(n-1)/2. So if this is substituted into the equation, the general statement should be discovered. Now repeat the steps above for other values of p.
The chosen value for p is 7. Secondly, the knowledge of the triangular shapes was also applied to the creation of the 6-stellar numbers to discover the connection between the number of dots and the layers. By finding this link, it was possible to create an expression for the 6-stellar number which linked with the triangular numbers. 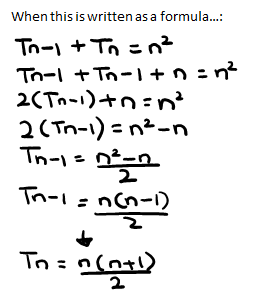 All these previous steps led to the formation of the general formula which was 12 x ((n(n-1)/2)+1. Then, by drawing the diagram of the 6-stellar number a particular pattern emerged. It was about the consistent addition in the number of dots as the layers increased. In other words, the first 'star' consisted of one dot, the second layer (star) contained 12 dots, the third had 24 dots, the fourth layer had 36 dots. As one can see, the number of dots is increasing by 12 excluding the first -> second layer. Without exploring the triangular numbers, it would have been difficult to express this abnormality. Fourthly, the relation between the 'p' value and the first integer of the general formula must be determined. This was found by comparing the 6-stellar and 7-stellar numbers, and was found that the first integer was always equal to 2 x p.
As all of the steps above was completed, what one needed to do now was just combine the results from the steps above to determine the general statement. Therefore, by doing so the general statement was found to be: Sn = pn (n-1) + 1. The final step was to test if the general statement could be applied to the stellar numbers in terms of 'p' and 'n'; which was successful; however with some few limitations such as the 0, 1, 2 and decimal numbers substituting the 'p' value. each star diagram to have a more organized piece of data to examine closely. Term Number S1 S2 S3 S4 Stellar Number 1 11 31 61 I realized that this information goes by close to the same pattern at the 6-stellar numbers do. To those who are not familiar with matrices, they are a rectangular table of numbers, or more generally, any abstract quantity that can be added or multiplied. Matrices can be used to depict linear equations, trace various transformations and to record data that depend on multiple parameters. Using this visual representation, we can model the visual pattern of the stellar shapes for the stages S5 and S6. To find the number of dots in each stage, one can simplify each shape as a combination of a number of simple stars with 6 vertices and the dot in the middle. A cubic fit applied to the data points via Graphical Analysis 3 follows: Next, a model function can be developed to fit the data points of the graph. In this investigation, a linear function will be created. A linear function, as discussed above, is a function in the form y=Mx+B.